Villa Riviera is a small, 30-unit, Mid-Century complex, built in 1967. 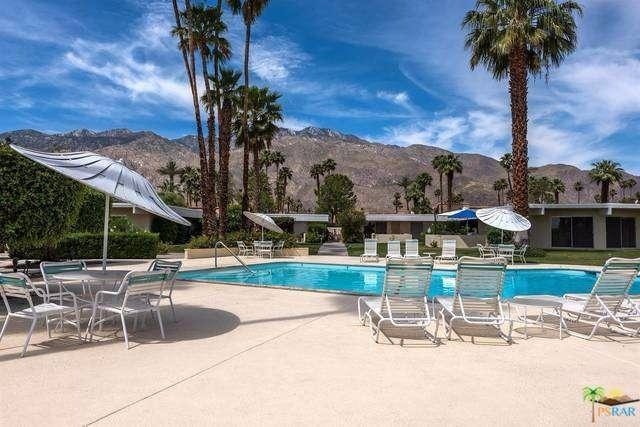 It exemplifies the gracious, spacious desert resort lifestyle that is such a draw to the Coachella Valley. Sales began either late in 1967 or early in 1968. However, things didn't go so well and nothing sold. The bank that owned the property decided to rent them out to get some cash coming in. In 1975, when economic conditions were better (cut-rate 7% mortgages! ), the bank formed the first homeowners association and the units sold out very quickly (in just a few months). The modernist architecture features flat roofs, large overhangs, private open atriums, large private-use front patios, open floor plans and large sliding-glass doors to bring the outside in. The complex is made up of 10 buildings, each with 3 units. All apartments are 2 bedroom, 2 bathroom floor plans; some floor plans larger than others. Some started life as a 1 bedroom unit with a large "bonus area" complete with a closet and an accordion door to make an extra room when the grandchildren visited. All the former 1 bedroom units have simply replaced the accordion doors with a permanent wall to make it a proper bedroom. Most have their original atriums while some have been enclosed. Six of the inside units never had an atrium. All have washer/dryer hook-ups, large master suites, central AC, gas heat and hot water. Water, trash and a cable TV/high-speed internet package are included in HOA dues. The generous 5+ acres of fee land are verdant and lush - something you just don't find in modern developments. We've updated the landscaping to more drought-tolerant and pest-resistant desert plants that are still green and colorful, but need less water and are better-suited to survive the summer heat. Combined with gently rolling topography, the mixture of new and older plants gives many of the front patios a sense of privacy. There are over 80 tall, old palm trees and lots of mature grapefruit, lemon and tangelo trees. We've also added both Myers lemon and a variety of lime trees that beg you to make fresh cocktails when the fruit is in season. Villa Riviera is a beautiful oasis in the center of Palm Springs and we love it! We are the middle complex (of 3) on the southeast corner of Ramon Road at Sunrise Way, across the street from Sunrise Park. Firebird Estates (our sister complex) is to our east and The Sunflower is to our west.